Hanging signage is simple, affordable, and very effective for getting your business noticed. They are usually installed perpendicular to your building front so passersby can easily read your business name and even check out what services you offer. King Signs, Graphics & Imaging specializes in maximizing a signage’s advertising potential. Our expertise in the choice of fonts, sizes, colors, and overall sign design ensure clear identification and visibility even from far away. King Signs, Graphics & Imaging produces hanging signs that match your brand’s personality, and this is why we have an assortment of options for your signs. We’ve got the wall mounts, ceiling brackets, sign frames, panels, and even lighting kits to fit your business needs as well as your signage budget. Are you looking for a sign that communicates stability and permanence? King Signs, Graphics & Imaging’s projecting signs and brackets are a great option. They’re similar to typical hanging signs but they don’t swing with the wind. Projecting signs and brackets made by King Signs, Graphics & Imaging are highly customizable and can be made using in a wide selection of materials. 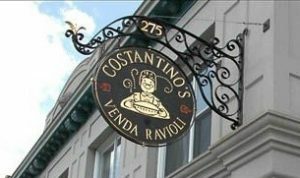 Your projection signs can have a classic feel with ornate iron brackets and wood or metal panels. If you want a more modern commercial look, you can have a PVC foam board cut cleanly to your preferred shape and attached to the wall using a minimalist bracket. However you want your sign to look, King Signs, Graphics & Imaging can design, customize, and install it for you! Charming and eye-catching blade signs aren’t just for inns or bed-and-breakfast establishments. King Signs, Graphics & Imaging can tailor them to suit your brand and speak your message. They’re strategically placed outside your business in order to attract potential customers and lead them into your store. 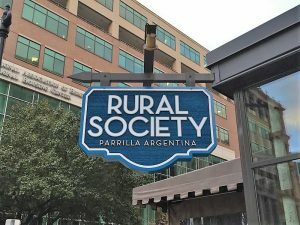 With the wide selection of materials that we offer, you’re sure to have the hanging sign that represents your unique branding. King Signs, Graphics & Imaging builds signs that withstand outdoor elements, and we do this by using only the most reliable materials. Panels can be made with solid timber, banners, fiberglass, aluminum, PVC, and even cast polyurethane. Your customized sign panels also come with highly customizable posts and brackets. King Signs, Graphics & Imaging creates brackets that go perfectly well with your panels. They can be made from wrought iron, wood, and stainless steel. 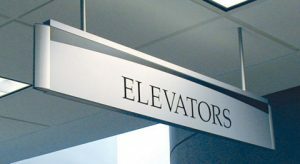 Whether your indoor hanging signs are promotional materials or wayfinding and directional signs, King Signs, Graphics & Imaging is equipped with the manpower, materials, and knowledge to deliver them to you. You have the option to keep them simple with acrylic, PVC, or corrugated plastic. You can also get more sophisticated sign frames, illuminated sign boxes, or even LED message boards. 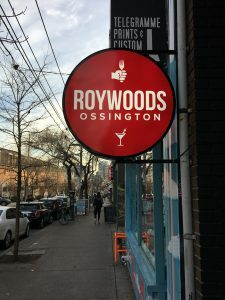 King Signs, Graphics & Imaging has been in the sign-making industry for many years and have worked with enough business to know how important it is for you to get the exact sign that you need. And we can do that for you. Our strong team of graphic artists can sit down with you and discuss exactly what your brand’s personality is and what design goes well with it. Once you have the design that you want, our team of signage specialists can then take over. With King Signs, Graphics & Imaging, expect high-quality and durable hanging signs meticulously crafted by the best sign makers in town. Installation of hanging signs is also quick and hassle-free so your signs can go ahead and start attracting customers in no time. There’s a reason why businesses have used hanging signs for centuries. And that reason is that they’re simply very effective at getting customers in, especially when these signs were strategically done by reliable sign companies like King Signs, Graphics & Imaging. We’re excited to show you just how effective hanging signs can be for your business! 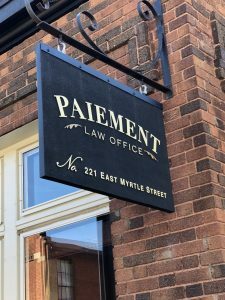 Call King Signs, Graphics & Imaging today at (612) 294-8688 for your Free Consultation with a Hanging Signs Expert! It was so convenient for us. Awesome customer service and lovely work!